I’m always on the lookout for persuasive techniques at play in the real world. I was disappointed at the number of SXSW trade show vendors who were using old-school reciprocation techniques for gathering lead data. Old-school reciprocation presents a barrier to be overcome before you can get the reward. Give us your info and we’ll give you a shiny toy. I resent that. Most people resent it. Especially when the shiny toy is another crappy pen or key ring that people don’t value highly enough to make the barrier worth removing. One answer is to move to larger rewards, but with a raffle or other random element to amortize the overall cost to the promoting company. But even when the reward is greater, like the nice piece of consumer electronic gadgetry I won for giving my details at one vendor’s booth, I’m still dreading the spam email I expect to receive. That email will most likely be poorly targeted based on my zip code and some generic understanding of what motivates a SXSW attendee. What’s interesting is that there were other companies who had shinier toys and were giving them away free, with no obligation. That’s the Ben Franklin effect at play. Here, the unresolved favor that the company has done for me leads me to be more receptive to their messages in the future. There were also companies who made something free. They offered something of real value for no apparent cost. 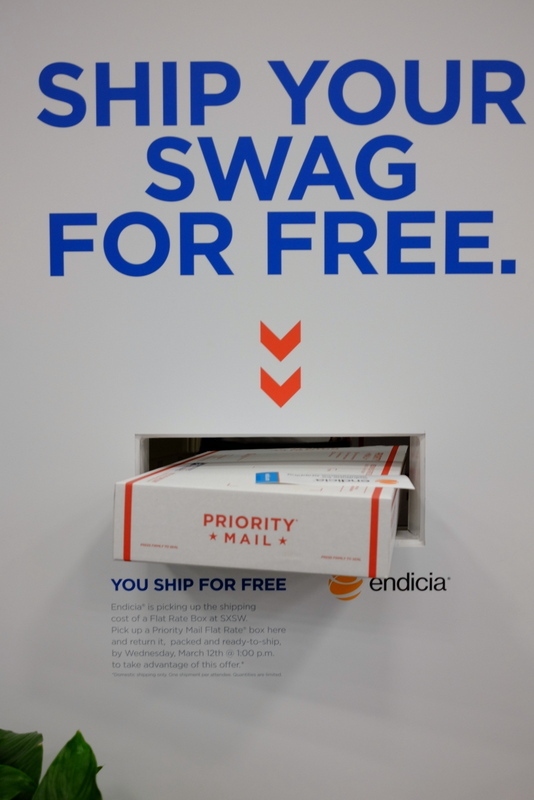 Everything from free use of their product for a limited time, through sponsoring a lounge with free refreshments, to shipping all the other crap you’ve picked up at the trade show home for you. That one is particularly clever for two reasons: One – you have to give your full name and mailing address to them, which they can obviously use for lead generation. Two – they slip a piece of paper into the box and a sticker on the outside, so you are reminded of their brand one week later at a time when you are feeling excited about receiving a parcel in the mail. This association of a positive emotion with their brand has a large impact on your memory for and feelings about that company. The trick is to find a way to give something away free that people will value. Remember, value isn’t necessarily tied to dollars. Value could be created through scarcity (limited edition versions tied to the conference), making people feel important (free VIP tickets to an event), aspiration (a chance to meet a celebrity), experiencing ownership before making a purchase (driving you between venues or back to your hotel while it’s raining out), or just the positive association of a friendly, low-pressure experience in a sponsored lounge. It also helps if that valuable thing has some direct or indirect association with your brand, so that recipients remember your brand when they use the product or when they think back to the good times they had at the event. To that end, I’ll give a shout out to MediaTemple and Roku/Hulu for making me feel important, Hulu for chances to meet celebrities, Chevy for chauffeuring me on occasion, PayPal and Beaconfire for the lounge experience, Bloomberg, esurance and Hulu for the raffle wins, and endicia/USPS for sending all my crappy free pens home for me. This entry was posted in Free must have value, Give to get, Make a request, Make something free, Ownership before purchase by administrator. Bookmark the permalink.